Time to receive your FREE Magic DVD so you can Shock Your Family and Friends With Your Unbelievable Magical Powers! If a professional magician tapped you on the shoulder, and promised to teach you the secrets to mastering the art of magic, would you let him? Well here at Free Magic School we have arranged the next best thing… If you are serious about learning Magic then we want to send you a FREE* Magic DVD and it’s time for you to join the MAGIC CLUB. Here at FreeMagicSchool.com we have teamed up with Magic Makers to bring you an opportunity to learn magic from the comforts of your home! If you have a DVD player, and you’re willing to spend a few minutes practicing every day, then this FREE* Amazing Sponge Balls Magic Training DVD is just the thing you need to get started. That’s right… in our Magic School we send out a Magic Training DVD every Month. So what are you waiting for… Sign-up already so you can get started immediately! Instead of paying our usual $24.95 monthly membership fee for your first DVD, to get you started all we ask just pay the $15.95 to cover the costs for shipping and handling and I’ll get your FREE DVD in the mail for you. And as a BONUS for trying out our DVD Magic Club of the Month, I’ll also throw in a box of FREE SPONGE BALLS so you’ll have everything you need to start learning immediately! If within 14-days you wish to cancel your membership, you will not be sent another Magic DVD in the mail, nor will you be billed the $24.95 for membership. You don’t have to return the DVD to us if you cancel… Consider it a gift for trying our club membership. NEW FREE BONUS JUST ADDED IF YOU SIGN-UP RIGHT NOW!!! If you’ve never seen this book in action, here’s how it works. You show a coloring book with all uncolored pages. Then you make a magical wave over the book, which instantly makes all of the pages colored! You then give the coloring book a final shake and ALL OF THE PAGES ARE BLANK again. Here’s My No-RISK Guarantee To You! I am so sure you’ll love the cutting edge magic lessons you’ll be receiving each month, I’m giving you my famous iron clad “you can’t lose” guarantee . . .
Here’s the deal: If for ANY reason you’re not completely satisfied with this training you’ll be receiving from the DVDs you’ll be receiving in the mail each month, simply drop me a line over at our support center any time over the the next 14 days and we’ll cancel your membership immediately and you won’t be billed. 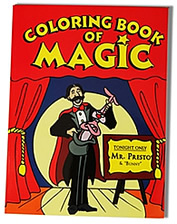 In fact, you can keep the DVD, Sponge Balls and Magic Coloring Book just for giving it a try. There’s no risk on your part whatsoever. . . all the risk is on me!